Nokia 225 Dual SIM phone launched in India, it priced at Rs. 3,1995. The phone announced on April and now it listed on Nokia's online store. The phone available in 5 color variants Black, Green, Yellow, Red, and White. 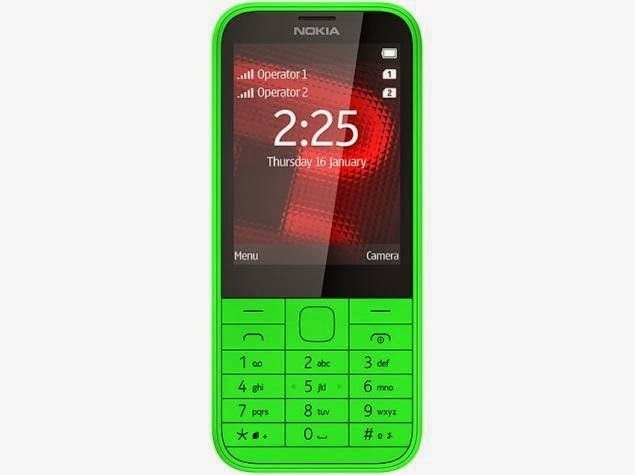 The main features of Nokia 225 is it comes with 2.8 Inch Transmissive LCD display which gives 240X320 QVGA resolution and 142ppi pixel density. Nokia 225 sports 2MP camera for capturing and recording needs. The phone runs Series 30 operating system. Included connectivity options are GPRS, Bluetooth, and Micro-USB port. Its external memory capacity is 32 GB using MicroSD cards. The phone powered by a 1200mAh battery, which offers up to 648 hours Stand-by time and up to 21 hours Talk time. Nokia 225 come with flashlight, a digital clock, calculator, recorder, converter, calendar, alarm clock, phone book, reminders, and clock. It also has the Nokia Xpress Browser with built-in Bing search.